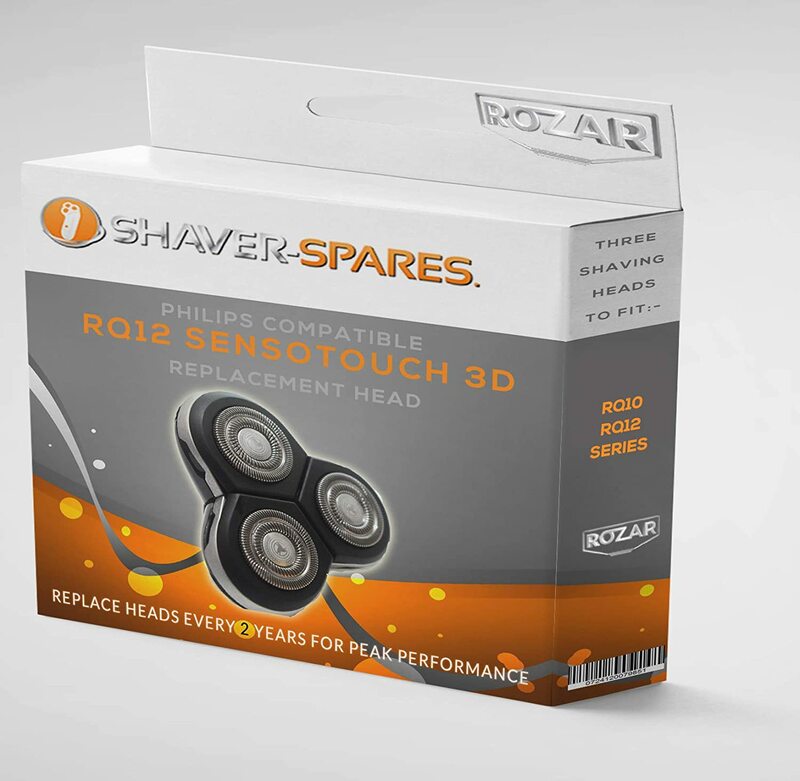 A new generation of shaving brush for a new generation of user. The difference is in the bristles! Exclusive men-ü bristles are manufactured to be smooth, solid & non-absorbent. Animal bristles such as badger are like human hair – scaly, often with a hollow core & split ends. In order to create a lather, shave crème & water have to penetrate badger bristles before product is on their surface. Also, animal bristles expand & contract through absorption of shaving product & water which can lead to bristle loss. The bristles are too long and too soft.. much prefer the bristles on their standard brush... I will continue to use my old brush and use this one only for travel. Okay, I admit getting this to review is a bonus, however I know the price its being sold at and one has to question it because frankly its not worth 25 quid. Now, don't get me wrong. 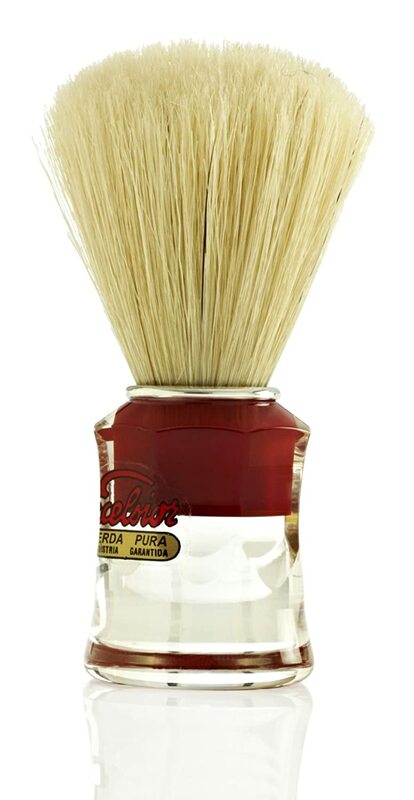 This is a great shaving brush. But then so is the one I bought at Boots for u00a35 which has served me well for the last few years. And that's the point. 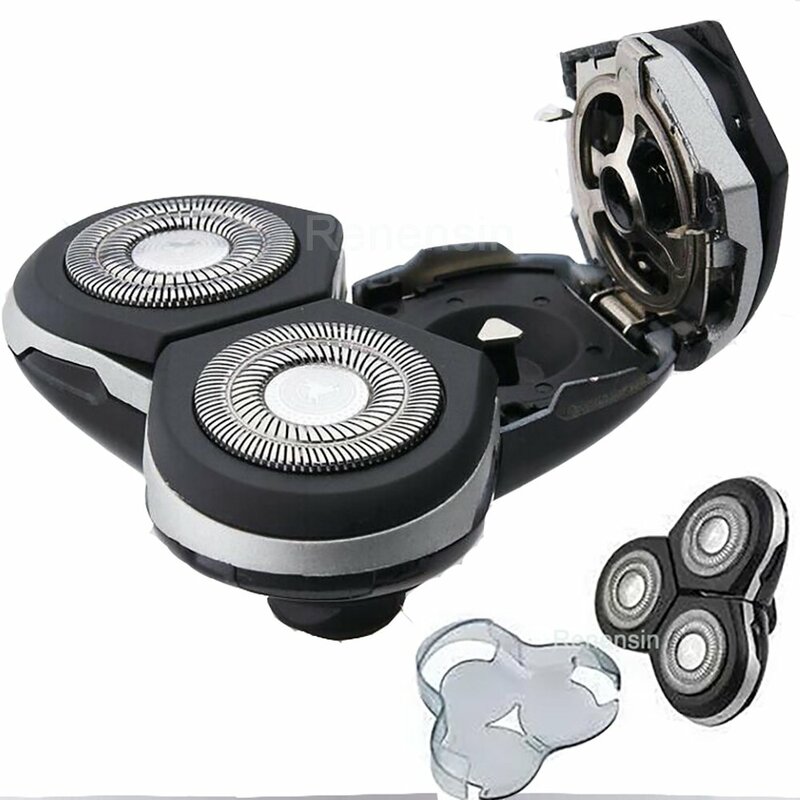 Is this better than my cheap one? Maybe. Is it five times worth it? Nope. What you have of course is the image factor and of course the advertising and price point that comes with it. For some me the whole daily cosmetic program and the gear they wear is important for their image and self esteem. I understand that. I, however am 50 years old and come from a North Eastern shipyard background and the particular mores that come with that. Men's moisturiser and uber expensive shaving brushes are by nature a bit of an anathema to me. All I want is something that does the job at hand that justifies the cost. Anyway, this is a good brush. A bit stiffer than most but I don't have an issue with that. I have a heavy growth and I know that the best shave is achieved with a good use of a brush to lift the hairs and get them softened. For that you need something able to move them a bit and a stiff brush is required. This ticks that box. The claim that this will use less creme is nonsense. Maybe in lab tests where the exact amount is measured out maybe. 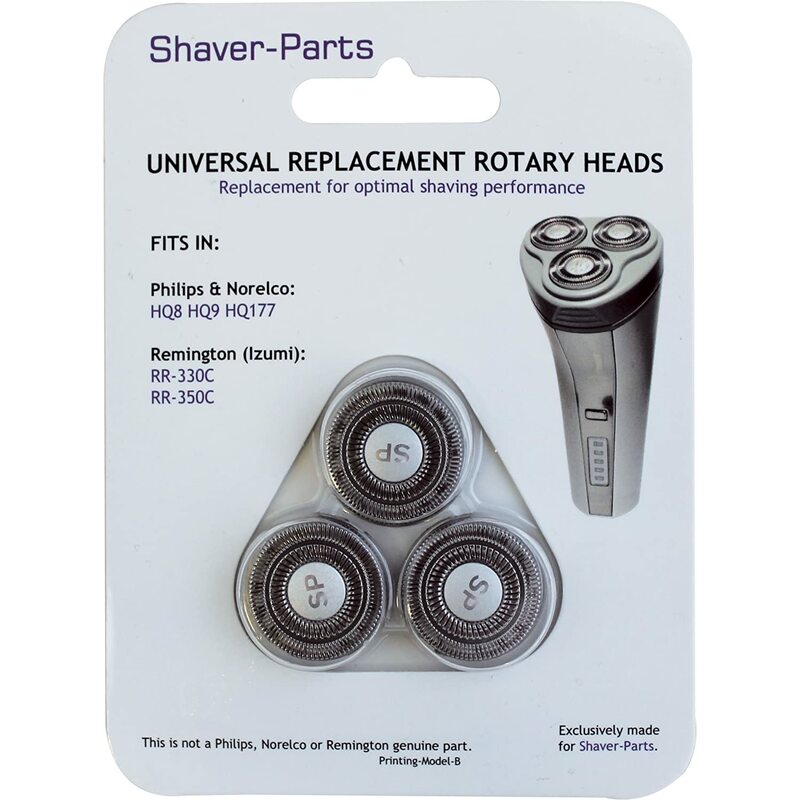 However back in the real world you use the shaving creme you normally use in the same amounts regardless. You are not going to faff about at 6.00am trying to minimise the amount of shaving creme you apply. Chances are your eyes have not opened at that point. I note that someone said he can't get a decent lather. Well I doubt that the brush is at fault. I use The Body Shop mens shaving creme and have done for a million years because frankly there is nothing that comes close to it for achieving a fantastic lather and facial lubricant. Its not even expensive when you consider it lasts forever. I also have a water softener in my house which makes a huge difference. So, what else? 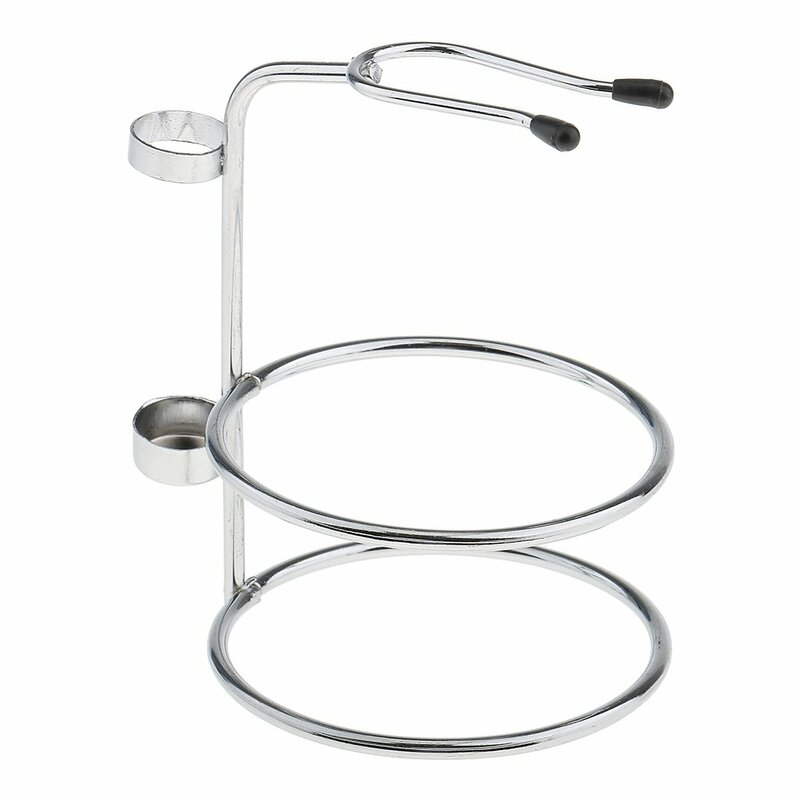 It comes with a stand. Well you won't use that after 2 milliseconds unless you have OCD. There is a small tube of shaving creme. Tried it and its not as good as the Body Shop stuff but individually probably costs an arm and a leg more. Take my advice and try out the Body Shop stuff. Best out there. Although I usually use a badger bristle brush when wet shaving I always feel a bit guilty about using such animal products. 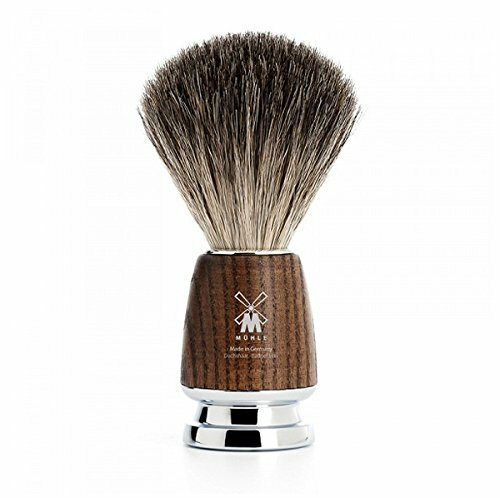 This Italian-made shaving brush by men-u00fc uses a modern synthetic material for the bristles so is suitable for those not wanting to use real animal hair. 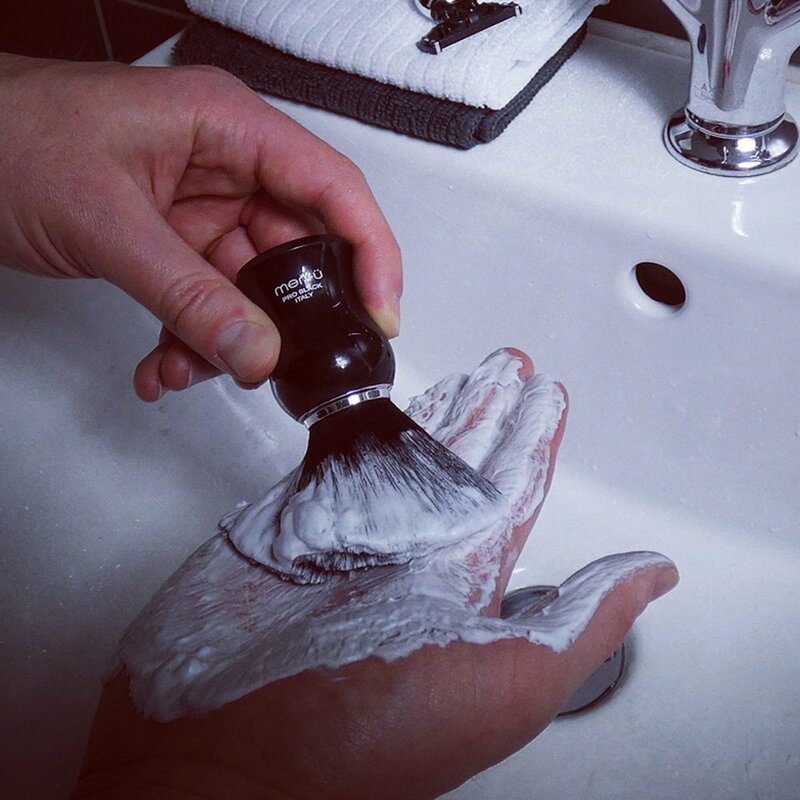 This men-u00fc brush gives a good lather u2013 especially when using the supplied men-u00fc Shave Cru00e8me u2013 but perhaps not quite as good as a quality badger brush does. 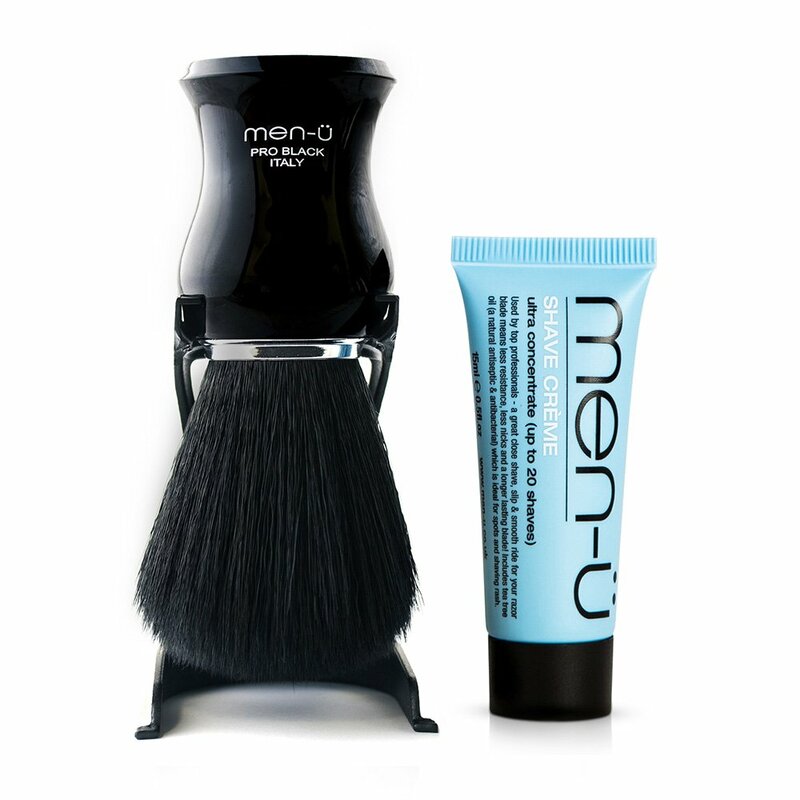 At around twenty-five pounds currently from Amazon this men-u00fc shaving kit includes the brush itself, plus a stand style holder, and a15ml tube of men-u00fc's shave cru00e8me. Not bad value for the price and worth trying by those preferring to use non-animal derived products. I've been buying men-u products on and off for many years. I really like the brand and have only been put off from buying more often and more regularly due to the price and availability of the products in the range. 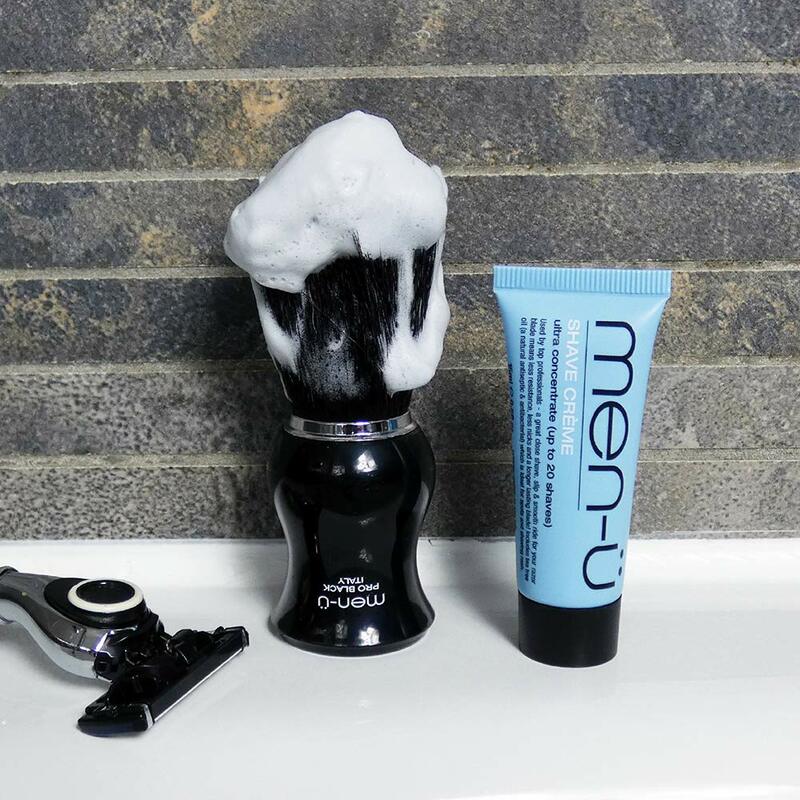 This shaving brush with stand and sample shaving cream replaced for me a cheaper men-u brush. This one is clearly superior- the bristles are far softer, which so far are not separating as my previous one did frequently. I can only criticise and deduct one star for the price, which at just under u00a325 as of writing is very expensive. However, it is a quality product that will last years. 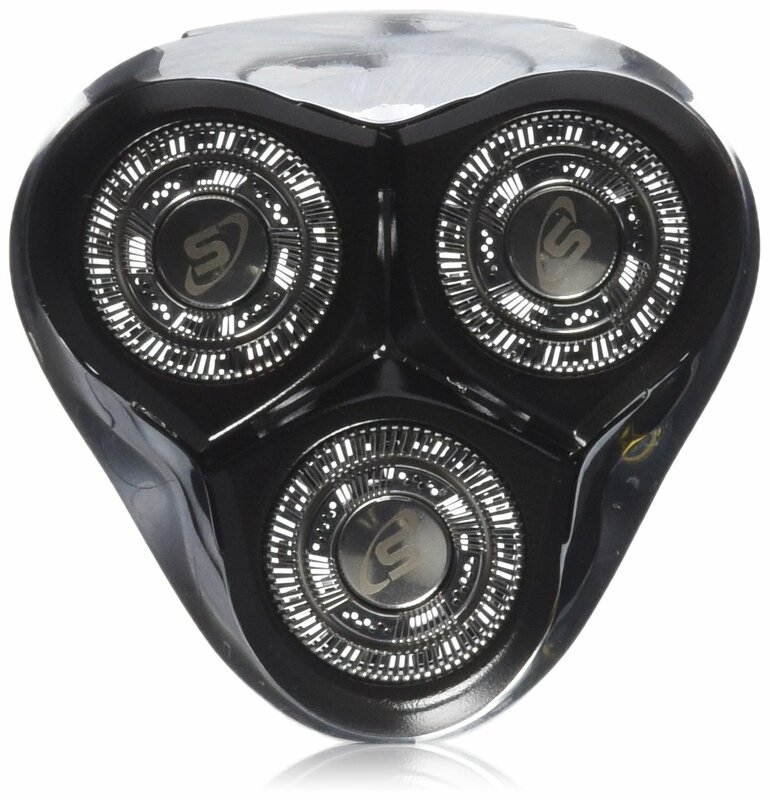 Shaving is no longer a chore, but an experience! 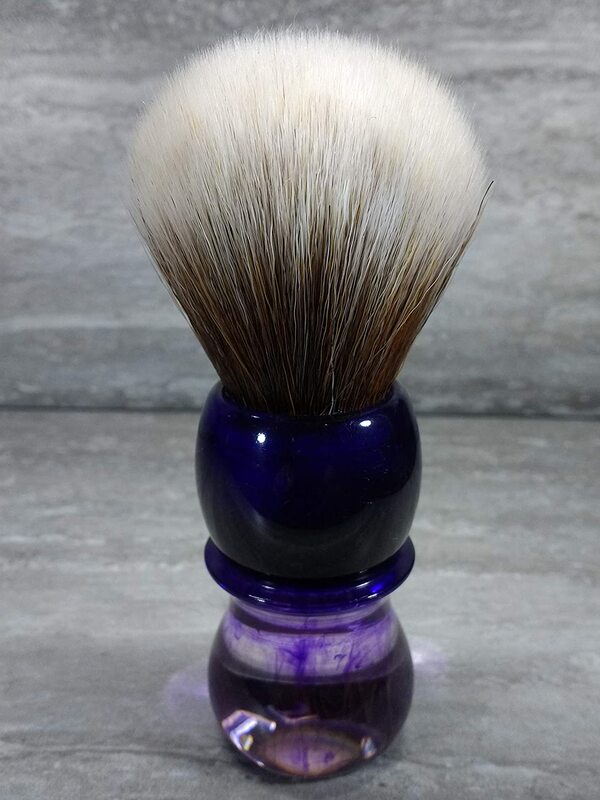 After 20+ years of using shaving foam, I thought I'd try a proper shaving brush. Wow, what a difference! So little effort to get a really comfortable lather and the brush motion seems to stand up the hairs more so you get a smoother shave. Really impressed with this brush, it's easy to use, feels comfortable and dries out quickly after use. The stand is a little flimsy as made from thin plastic so easily topples over but the brush itself is excellent. If the stand had been a little better I would have given 5 stars. 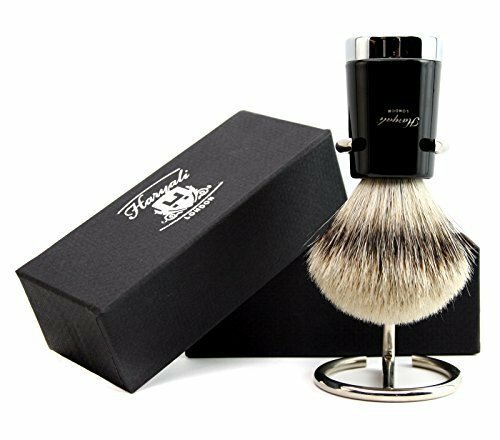 This is a decent shaving brush. Worked well for me (I live in a very hard water area which may impact lathering experience), produced a good lather and was a nice, firm brush to real massage the skin and hair follicles. Its not perfect, the lather produced is quite large and tends to escape the brush, but it was a good experience otherwise and i think left my skin in a lovely condition, almost exfoliated. I didn't bother with the sample shaving creame, it's not my usual brand so I focused on the brush. I'm generally a fan of the brand so was happy to give this brush a try. 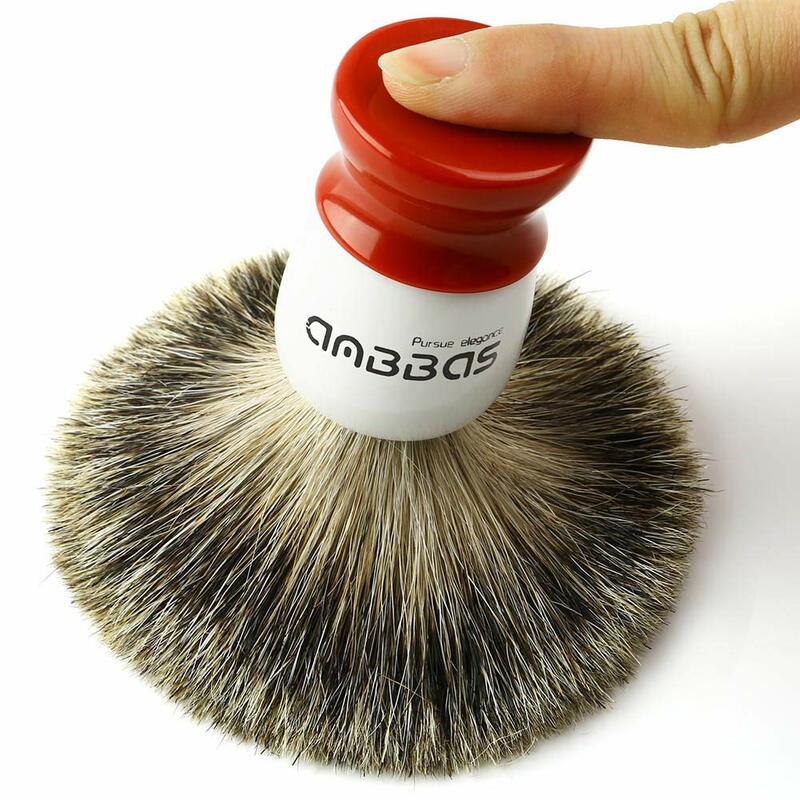 Whilst it is a reasonable budget or travel option, the functionality falls short of badger brushes. 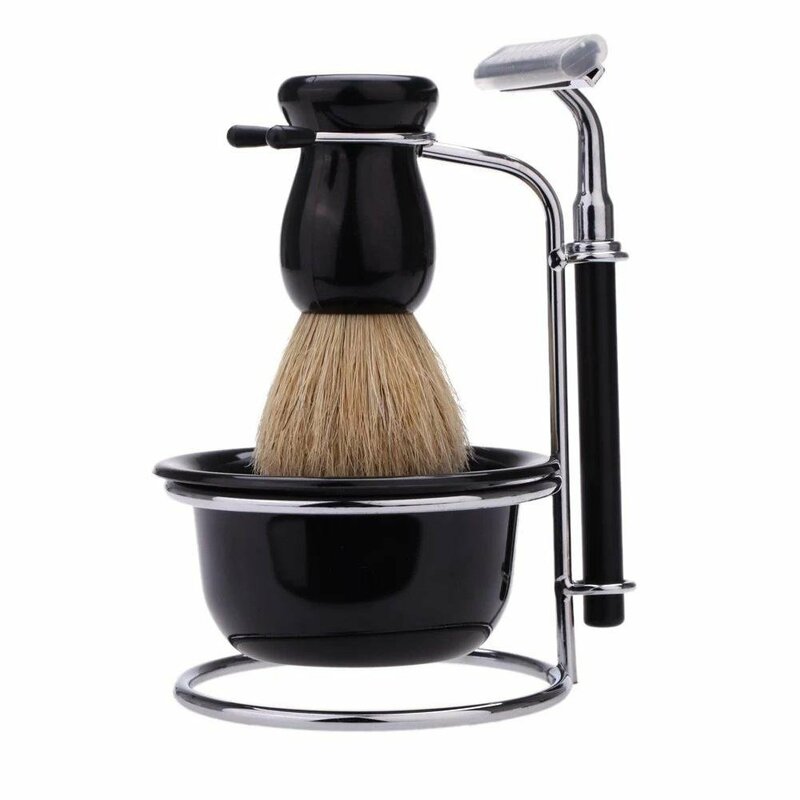 The synthetic bristles are slower to aerate and lather the shaving soap and feel harsher on the skin. The handle feels a little insubstantial too. For the money, this is a reasonable buy but badger brush users will be disappointed. This brush might be ok as a back up, but it feels very synthetic and light weight to me. The base of the brush is plasticky and lightweight and the stand is also very lightweight and plasticky. The bristles feel low quality and whilst it looks quite nice, I am disappointed with it. I think for the price it should have been more substantial. Might use it in a travel wash bag but it will not replace my usual brush.